My Epiphone Johnny A without the Bigsby. There's so much right about the feel, tone, and comfort. e?? ?, rauchman and misterg71 like this. e?? ?, Heinz W, Merrywoodsman and 2 others like this. Tough call for me. I have a rule about owning guitars...if I couldn’t see it being my #1, I don’t need it. Between my partscasters and BelAire’s, I’m good with any of them as my #1, but recent events in my life might force me to sell all of my gear if I don’t have a change of fortunes soon. I'm liking the Reverend love. My number two is a Reverend Club King RT with a duesenberg vibrato. Won't ever sell that one either. I own a Reverend Charger 290 LE and was thinking about swapping that Bigsby for a Duesenberg Trem. Was it a lot of trouble installing the Duesenberg? it came that way from previous owner but no. its a direct replacement. I HAD no IDEA Epiphone had a Johnny A. Well, I think its time to order ………..hold on while I check inventory. Oh my, plenty in supply. Right now that would be my TAG Hollow T. It was my (almost) birthday NGD last Saturday. Plays like butter, a real looker (swamp ash/alder hollow body with translucent butterscotch finish and a caramel maple neck), light, and sounds freaking great with the TAG TF1 neck pickup and an M3 minihum in the bridge. I was worried it might be a little dark with the minihum, but it has plenty of top end and no icepick, thank goodness. Hopefully I'll get around to posting a picture. EDIT Being a supporting member, I tried to upload a pic to a media album as per the instructions elsewhere, it looks like it uploads but nothing in the album, it's a jpg file that is a bit over 3M. Seems to me it should work. VPN issue? My next TA will be a butterscotch tele with a contour body and oversize neck. I like the std thin +.050. Been looking for one for a long time, used. I see a few none-contour, but love contour. Sorry to hear you having a hard time at the moment enharmonic. It was in many ways good for me to downsize, now just 2 guitars and 2 amps, the most important ones to me. atb. (allthebest)to you. My white Patrick James Eggle ‘96. The best guitar I have played or owned. '62 Custom Tele - This one just does it for me every time. 70' s Tone likes this. Late to the party - had to work! Mine is my 89 Steinberger GL Custom with Duncan Alan Holdsworth humbuckers and a Duncan Vintage Rail middle. I re-wired it from 2 to 3 PUs and added 3-way series-single-parallel switches for the humbuckers and a 6-way rotary pickup selector. It gives you both neck and bridge PUs as per a Gibson middle position, plus the usual 5-way selections. A wonderful guitar to play and it is very versatile. Never goes out of tune. Mine would be my late 80s 1962 RI Fender Strat. It is the best guitar I've owned that I've played. I knew a guy with a vintage SG that played better but I never owned it. Oh my goodness. That is beautiful! Double bound black has to be my favorite tele color ever. Thanks, Yeah the double bound with black grabbed me too. It sounds as good as it looks. It has the raunchiest pups of all my Tele's and it just smacks ya in the face. 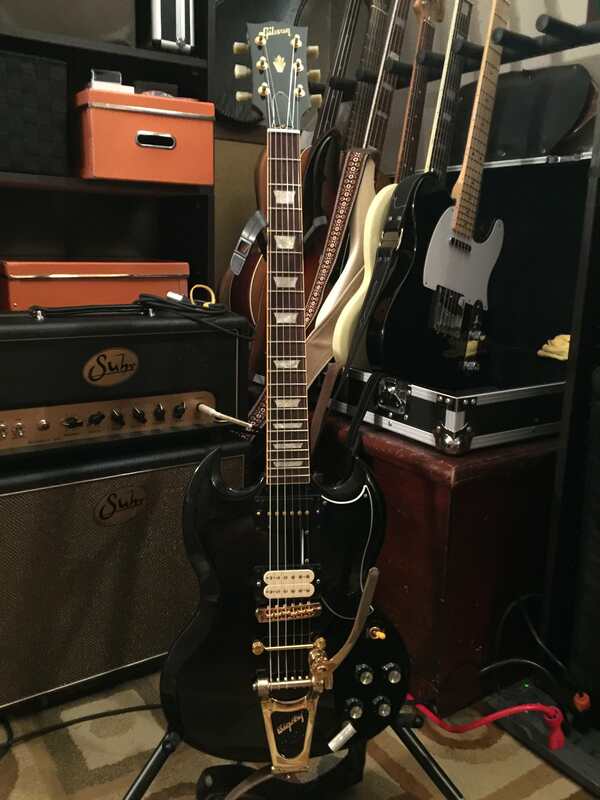 My #1 for the last several years is my 2004 Gibson '61 Reissue SG. I've modded it quite a bit, adding a Bare Knuckle Nantucket P90 in the neck, and an old double cream Seymour Duncan '59 in the bridge. Re-did the wiring with 550k linear taper volume pots, and 500k no-load tone pots. Also added the Bigsby B3 with Towner bar and Golden Age roller bridge. I can't live without a Bigsby after adding it to this one. This may not be the best guitar in the world, but it's just home to my hands, and it's the one piece of gear that I will never part with. Just about anything else could end up on the chopping block as GAS strikes, but not this one. e??? and Mincer like this. My 62' strat. NOT original. Actually only the neck is a real pre CBS 62'. I got the neck around 92-93' from Daves Guitar shop. No internet back then. He had these little quarterly fliers I received after sending in a request from an ad in the back of Guitar Player. 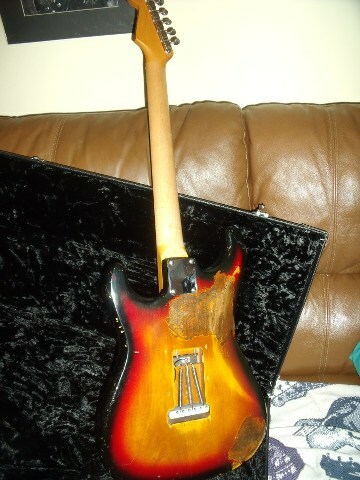 His personal gig guitar was a vintage yellow parts guitar with this 62' neck and a modern strat body. The neck was a refin and was refretted with big wide bass frets. I LOVED that neck from the first day I played it. From 92-the early 2000's I went through several bodies and pick up configurations for it. Then one day I saw Estoric Pete here selling this body. Some dude in NYC made it . Most realistic relic I've seen . Its a really high quality alder . I got a set of early Bare Knuckle pickups , they didn't even name the sets back then. 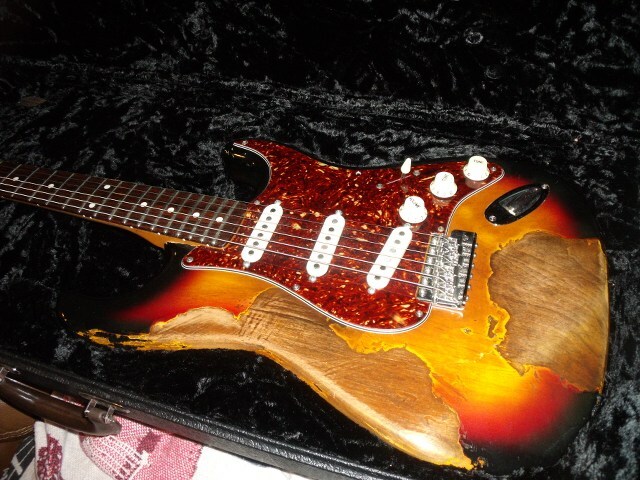 and hardware from a custom shop strat someone parted out. After putting them together it was like Magic how all the parts worked together. The clouds parted and a giant light shown down from the heavens. This guitar paired up with my Juke Warbler just worked. So much so I have had gear come and go all around these two. But I cant ever part with this strat and my Juke. e??? and justabubba like this. I suspect my Nocaster would be the last to "go"...on the left. 70' s Tone and e??? like this. I have numerous guitars, and for a while now I’ve been playing them instead of this one for a variety of reasons. Pretty much all of my guitars are good or great players. The other day a friend came over and wanted to do some playing. 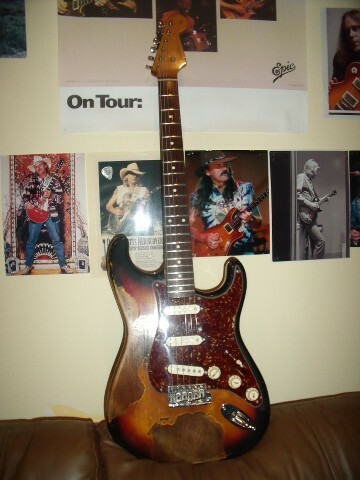 I pulled out the Strat and well... it was like making love with the best woman you’ve ever been with after having been apart for a very long time.